• Dogs. How Far is Too Far? • Slow, Close-Working or Big-Goer? A GSP pup on point. I have been breeding and training German Shorthaired Pointers for over 15 years. During this time, I have determined that the opportune time window to introduce pups to quail is 10 to 13 weeks of age, before that, their attention span is too short and much after that, they are too fast and agile to work with pen raised birds with success. I use nature’s tools and the pup's natural instincts to facilitate the introduction. The check cord will be used only at the 3rd step if needed due to the pups age and ability to run faster. Step 1: You will need 3 quail and your pup. 1) Pull the primary flight feathers on both wings from the first quail and allow the pup to chase, catch and carry the quail, only positive encouragement from you. 2) Pull the primary flight feathers from one side of the second quail, this will allow the quail to “flutter” in the air and gets the pup really excited. Allow the pup to chase and catch. 3) Do not pull any feathers from this quail, put it to sleep and plant it where the scent cone will be easy for the pup to locate. Walk the pup around the area until it smells the scent cone. The pup may point, but will usually pounce and the quail will fly away. Step 2: One to two weeks following Step 1 – Again you will need 3 quail. 1) If the pup is lacking interest, you may need to repeat #2 from Step 1. 2) Plant the quail where the pup will not have too much trouble locating the scent cone. Walk the pup around the birds until the pup locates the scent cone on it own. 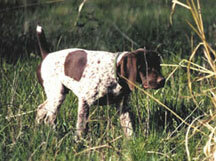 The pup may pounce on the 1st or 2nd one, but the quail will fly away and the pup will not be able to catch it. Note: By the end of Step 2, 75 % of the pups are pointing and holding their points. Step 3: One to two weeks following Step 1 – Again you will need 3 quail. Repeat #2 from Step 2. You can, at this step, introduce the check cord. Let the pup drag the cord. When the pup goes on point, hold the end of the cord giving the pup about 4 foot of slack. Stand on the cord so you are not tempted to pull the pup back. When the pup pounces on the bird and the bird flies away, the pup will hit the end of the cord when, or if, it chases. Do not give any verbal commands, this will allow the pup to “learn” that it can not chase. Note: By the end of Step 3, 100% of the pups should be pointing and holding their points. You can keep repeating Step 3 for as long as you need to. I use the check cord as described in Step 3 when I begin to shoot birds for the pup (it then becomes a two person job, one to stand on the cord, and one to flush and shoot the birds). This allows the pup to “learn” that they must be steady. When the pup does point, do not say anything and stand perfectly motionless. This allows the pup to learn that the bird will not move if he doesn’t move, and since the pup has learned he can not catch the bird if he chases, he will be more apt to hold the point. Less is Better. Do not feel that you need to put the pup on birds several times a week. Putting the pup on birds once a week or once every two weeks is adequate. You want to take it slow and easy at this young age. Silent is better. I refrain from using verbal commands with young pups. This allows them to “learn” and not have to be taught.